Lake Julius was formed after the construction of the Julius Dam in 1976 - capturing the waters of the Leichhardt River and Paroo Creek. This lake covers about 3000 acres and is good for fishing, boating, water skiing, and now SUPing. It is located about 70 kilometres northeast of Mount Isa along a dirt road. We suggest you leave plenty of time for the trip as the road can be very corrugated in parts. For SUPers, the easiest and best way to access the lake is via the boat ramp or nearby by jetty. There are plenty of shady picnic spots and parking close by to keep an eye on the action. The lake is huge. SUPers will quickly find themselves exploring peaceful bays and watching the abundant wildlife that inhabit the lake's foreshore. There is very little recreational actively on the lake, so expect solitude and be prepared for a hard paddle if the wind picks up! In September 2015, overnight camping was not permitted at Lake Julius. This may change, so it is best to check with the Mt Isa Visitor Information Centre or local authorities. While caravanning through outback Queensland we decided to take a day trip to Lake Julius and test out the Fanatic Inflatable Stand Up Paddleboard (SUP) we were carrying in the car. It took us about two hours to reach Lake Julius from Mount Isa and it was definitely worth the trip to paddle around the beautiful waters on the SUP. The Fanatic inflatable SUP takes about 10 minutes to prepare before getting on the water and exploring the many small coves and inlets near the boat ramp. You can paddle through the water so quietly that the wildlife is not disturbed and we saw a number of wallabies and bird on the shore. We all had a turn on the 12' 6" Fanatic Falcon Air SUP, which is fast, very stable and easy to use, with a paddle that is fully adjustable to cater for people of all heights ( I am 157 cm and other team members are 187 cm). After we finished our day on Lake Julius the SUP quickly folded away to go back into the backpack and store inside the car for the return journey. 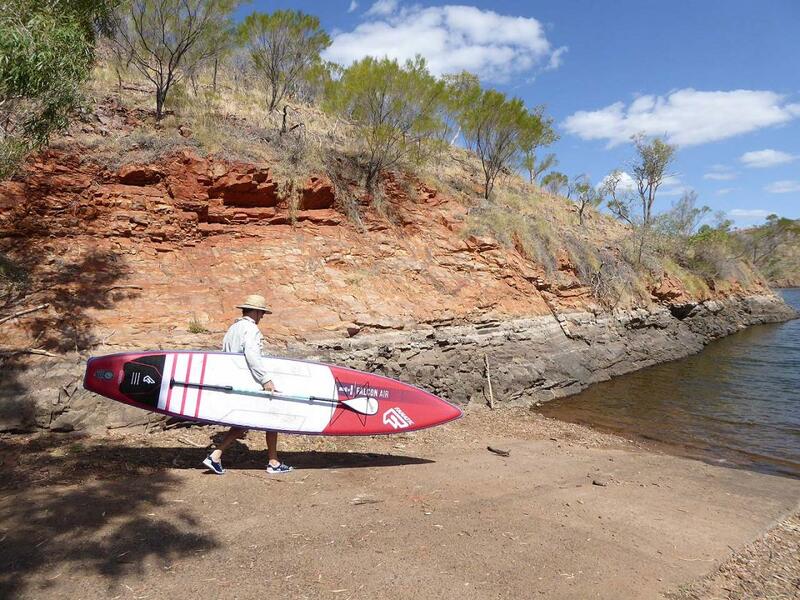 This was a fun day in outback Queensland on a little known body of water, and we were very pleased to have the Fanatic inflatable SUP to enjoy the beautiful Lake Julius. have you been to SUPing at Lake Julius? Explore SUPing at Lake Julius with RvTrips and find out where to stay, what to do and what to see. Helping caravan, motorhome and camper owners have a great holiday.